Earn to Die 2 1.0.73 APK is now available for Android and this game is free for everyone. The latest version give you better performance. It is said that the world is dominated by zombies. You act as protagonists who are trying to survive by going to a military base. The only thing that accompany is an old car. Initially you have a little money. But along the way you can upgrade for your old car so the trip becomes easier. This is a game that requires you to die many times in order to get money. Therefore, no need to worry if you often die early in the game. This sequel actually has no significant changes too. Only one major change for you who have played the first game. Changes in the design of the track. Earn to Die 2 using a track that branched and have a shortcut, if you are observant enough to find it. These changes are admittedly provide a different level of depth, in view of the track in the first game only straight and steep course. There are some slight changes such as a longer story and new vehicles. For those of you who have never played the first game, it is a game that will make you addicted. Especially when you have to upgrade the car into a monster zombie destroyer. BRAND NEW STORY MODE. Earn to Die 2 introduces a massive new Story Mode, five times longer than its predecessor. BUILD A ZOMBIE-SMASHING MACHINE. Unlock and upgrade 10 different vehicles, including a sports car, a fire truck, and even an ice-cream van. DESTRUCTIBLE VEHICLES. Vehicles are now fully destructible. Hang on for your life as your vehicle gets smashed to smithereens if you aren’t too careful. MORE ZOMBIES. MORE DESTRUCTION. MORE MAYHEM. What are you waiting for? That rescue ship isn’t going to wait forever! 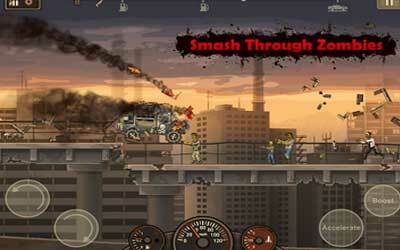 Prepare yourself for a wild ride – and seriously, there is nothing like smashing through zombie-filled factories! Complete 50 Missions across 10 Levels and unlock Achievements! This was an awesome game to play really had fun with it. It had a good selection of vehicles witch made it fun for the most part. Great work keep it up.